The game of survival is coming to an end. 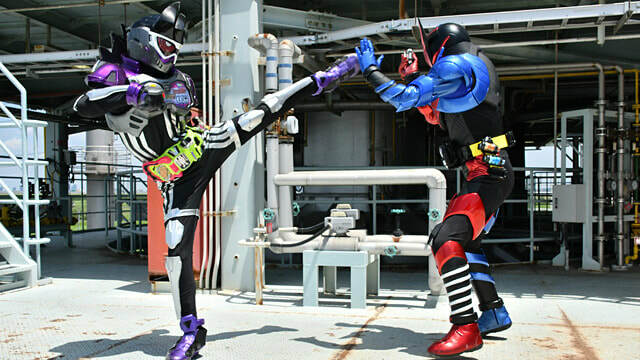 Will the Gamer Riders finally end Masamune Dan's evil plan and cure all the people who are infected with the Bugster virus? For now, read all about the episode title and summary for the final episode of Kamen Rider EX-AID! "The disease that is caused by the Gamedeus virus is rapidly spreading and to make matters worse, every time the Gamer Riders make a direct "HIT" at Chronos Gamedeus, it takes the lives of those who are infected by the virus and Kiriya is also infected and starts attacking his comrades. Amidst all of this, Poppy and Pallad will make a decision that could save the whole civilization from infection. Meanwhile, a mysterious warrior appears and challenges Kuroto Dan to a duel. His name is Kamen Rider Build!" A refference to Genm's first appearance in Ghost? Neat.